1. Log into Plesk Panel. To Generate a CSR on a Plesk 12 System perform the following. 2. Under "Hosting Services", select "Domains". Click the domain name you wish to protect. This link will open the Control panel for that domain. 3. 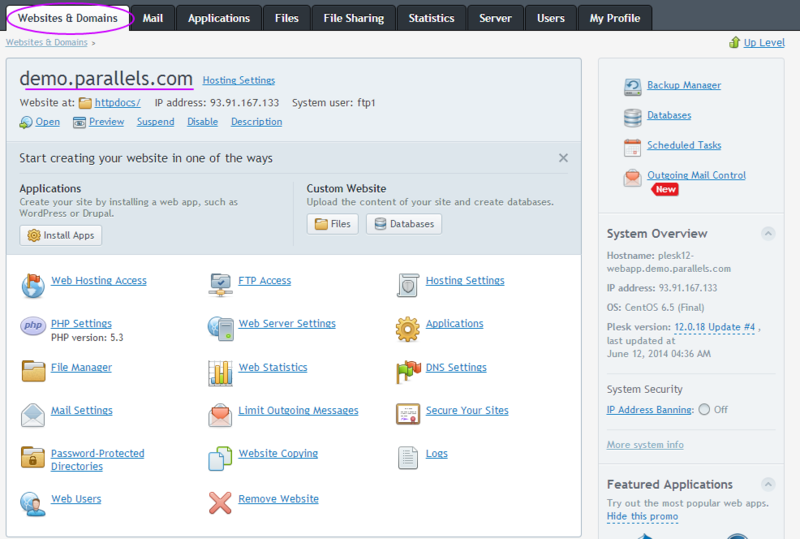 In the Control Panel, go to the Websites & Domains tab. Click the "Show More" tag to display management options. 4. Click "Secure Your Sites". 5. In the "SSL Certificates" page that then opens, click "Add SSL Certificate". 6. Fill out the information requested in the "Add SSL Certificate" page. The fields marked with an asterisk are required. When you have completed all fields, click Requestto generate the CSR. Country: Select your country from the drop-down list. State or province: Provide the complete name for your state or region. If not applicable, you can use your city instead. Location (city): Provide the complete name for your city or locality. Organization name (company): Provide the legally-registered name for your business. If not applicable, you can put 'NA'. Organization department or division name: Provide the name of division or department within the organization indicated above. Domain name: Enter the fully qualified domain name for which the SSL will be activated (common name). The common name for Wildcard certificates should be represented with an asterisk in front of the domain (*.comodo.com). E-mail: Enter your email address. The email used for CSR generation will not be used for domain control validation or for reception of the issued certificate. 7. You will see a message letting you know that the CSR was successfully created. From this page, you may click the green arrow icon to download the CSR to your local computer, or click "View Certificate" to see the encrypted CSR. 8. If you prefer, you may copy the CSR as text from the "View Certificate" page to your clipboard. Make sure to include the lines that begin and end the request.